"We are currently in week five of the START on Time! program and have had an average of 90 tardies per week, 18 per day ( a decrease of approximately 86 percent)." 71% of students qualify for the Free/Reduced Lunch Program. 8% of students receive Special Education Services. After five weeks with START on Time! 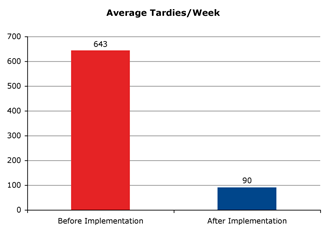 staff and students at Marshall Middle School have reduced tardies by 86%!